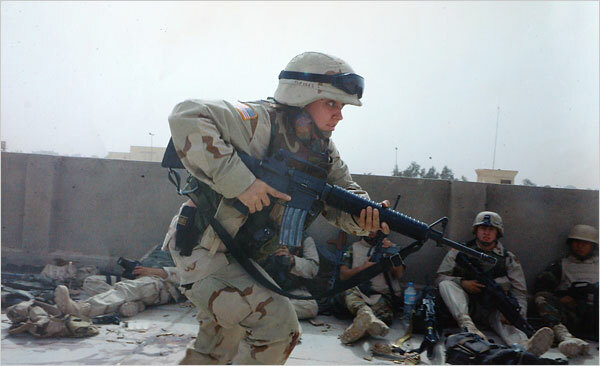 The New York Times leads with a report on the rising number of female troops gaining battle experience; while women remain barred from joining combat branches of the U.S. military, they’ve repeatedly been sent to the front line in Iraq. The Washington Post leads local, with a new poll giving Republican Robert McDonnell a hefty early lead in the Virginia gubernatorial race: The GOP candidate is up by seven points overall and up by 15 points among likely voters. Perhaps most troublingly for Dems, McDonnell is polling about even with his rival in vote-rich—and traditionally more liberal—northern Virginia, where he’s played down his conservative credentials and focused instead on issues like land conservation. Opposition to health care reform makes the front page on all three papers today. The activists like to cast their protests as spontaneous displays of popular outrage; still, the Post gets decent mileage from a report eyeing the conservative groups orchestrating the protests, which in some cases are led by established conservative-movement veterans and bankrolled by industry groups and conservative billionaires. The NYT eyes the battle for the airwaves: Some $57 million has been spent on health care-related TV ads in the past six months, most of it in last six weeks. “We’re looking at one of the biggest public policy ad wars ever,” says one media analyst. So far, the war’s being won by supporters of reform, who have outspent opponents by a ratio of about 5 to 1. Meanwhile, President Obama held his third and final health care town hall yesterday, telling a friendly Colorado audience that while there was “no perfect, painless silver bullet,” many of his plan’s detractors were being disingenuous. The NYT picks up on Obama’s push-back against unsubstantiated suggestions that he would implement “death panels” to deny care to the elderly: “I just lost my grandmother last year,” he said. “So the notion that somehow I ran for public office, or members of Congress are in this so they can go around pulling the plug on grandma? I mean, when you start making arguments like that, that’s simply dishonest.” Still, the Post notes that the president appears to be resisting the temptation to attack his opponents, and is instead seeking to recalibrate his own message. He continues that effort on the NYT’s op-ed page with a column calling for a more serious debate. “For all the scare tactics out there, what’s truly scary—truly risky—is the prospect of doing nothing,” he writes. Virginia Sen. Jim Webb traveled to Burma’s remote administrative capital yesterday for talks with Gen. Than Shwe, chief of the country’s ruling military junta, and was rewarded with the release of an American detainee and permission for a rare meeting with democracy campaigner Aung San Suu Kyi. Webb, who the Post notes is a longtime advocate of engagement with Myanmar, drew criticism from dissident groups for the trip; still, the NYT reports, the move comes as Obama officials are reassessing their hard line toward Myanmar’s military leaders and could pave the way for further U.S. engagement. Iranian opposition leader Mir Hussein Moussavi yesterday announced the formation of a new grassroots political movement, dubbed the Green Way of Hope. The NYT says the move marks his continuing defiance in the face of fresh government crackdowns; still, notes the LAT, Moussavi’s announcement failed to set out a specific political agenda or to give a clear strategy for rekindling the country’s opposition movement. The Post reports thatAyatollah Ali Khamenei, the country’s supreme leader, appointed a hard-line cleric as Iran’s new judiciary chief; his first task will be to oversee the mass trial of more than 100 of Moussavi’s supporters, who are accused of conspiring to overthrow Iran’s Islamic government.